The Nasdaq Biotechnology Index is poised to make a 52-week high and most likely an all-time high shortly thereafter. Biotech stocks are more insulated from the biggest concern for the market – the tariffs – than most industries. The rapid pace of new advancements continues to maintain the excitement for Biotechs. Biotech is poised to outperform broader indexes in the third quarter even though it will begin to face growing political rhetoric on drug prices as the November mid-term elections approach. The Prudent Biotech portfolio was up +51% in the first half. Promising opportunities will remain in the second half, even though trade friction is a growing risk for the broader market. The first half of 2018 saw the Nasdaq Biotechnology Index (IBB) make a 52-week high in January and thereafter enter a 5-month consolidation period. Even though the index managed to eke out only a +3% gain in the first half, the second-half has started on a brisk note, as the index has bounded +8% thus far in July. 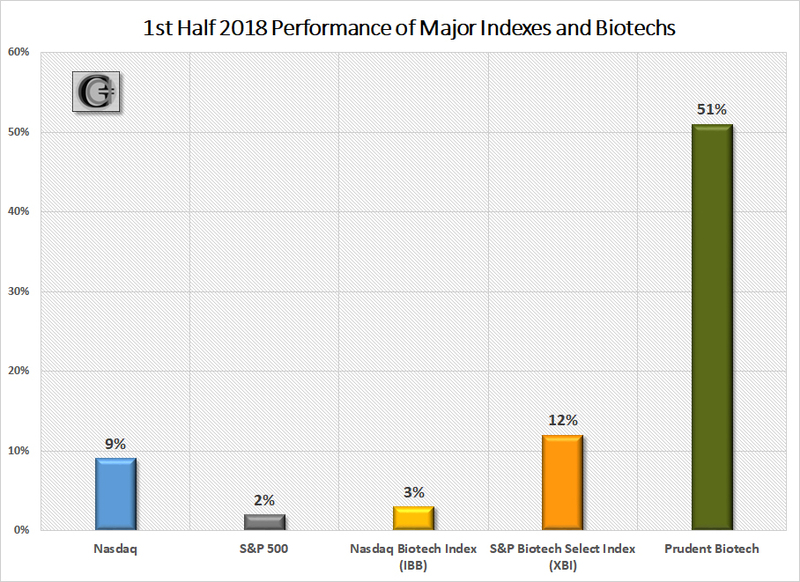 The S&P Biotechnology Select Index (XBI), which is relatively heavier weighted towards small and midcap companies compared to the Nasdaq Biotech Index, had a strong first half with a +12% gain, and is up +6% in July. The Prudent Biotech portfolio was up +51% during the first half, as the mix of small and midcap companies combined to deliver a robust performance. The economic environment is facing a unique risk that has not been encountered in recent memory. A steady escalation of broad trade friction which can involuntarily escalate into a comprehensive trade war and recast economic relationships and outcomes. A prolonged trade war can disturb the economic and supply chain linkages with an adverse impact on business confidence and investment, corporate profitability, inflation, and global economic growth. That will not be good for the stock market. There are many risks that biotechs are exposed to, but the tariff risk is not one of the prominent ones. Biotech research, for the most part, should remain unaffected by trade tariff issues. Small-cap and mid-cap biotechs have promising pipelines but no products that can come within the purview of tariffs. In addition, placing tariffs on drugs from biotech and pharmaceutical companies is the least desirable option for governments as it hurts their population immediately and directly where it counts - their health and wealth. Consequently, we believe that biotech companies have limited direct exposure to trade tariffs, and are relatively better positioned to withstand growing trade friction. However, they will not remain completely insulated from broader market declines triggered as a result of trade friction. The chart below captures the impact of open trade on costs. Product and service costs for many industries typically decline in an open trade environment. 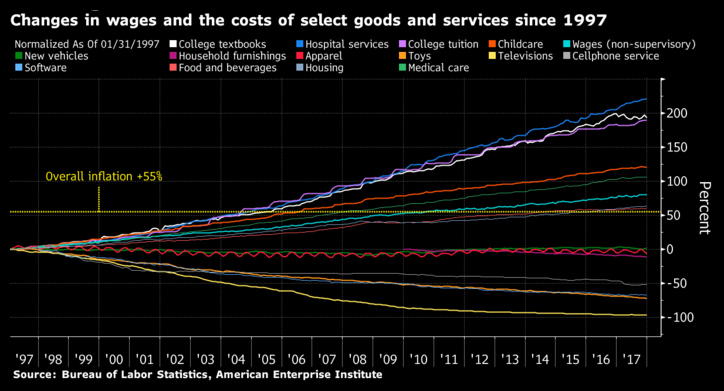 But in the case of healthcare and similarly education sectors, a key reason for the rising costs is the non-tradeable nature of these economic activities. The recent spark in biotech stocks was provided by Biogen's positive trial news on the vexing Alzheimer's disease, after what had been a year of disappointing news on the amyloid theory - the primary thrust area for most therapeutic efforts targeting Alzheimer. This uplifting news followed some high-profile drug failures, that had dulled the investor sentiment. In May, Merck (MRK) had published the results of its 2000 patient trial in the New England Journal of Medicine for its Verubecestat drug for treating Alzheimer's. The Phase II/III studies, that began in December 2012, and was stopped by Merck last year after an expert panel determined "virtually no chance of working," had revealed no improvement in cognition and function. This was heralded not just a failure of a single drug but the failure of a primary treatment approach predicated on the amyloid hypothesis, which rests on the assumption that cutting off the supply of amyloid beta to the brain can arrest the progression of Alzheimer's. Drugs that would block the enzyme, known as BACE inhibitors, could then also prevent the buildup of the beta-amyloid, and thus slow and even reverse the progression of Alzheimer's. 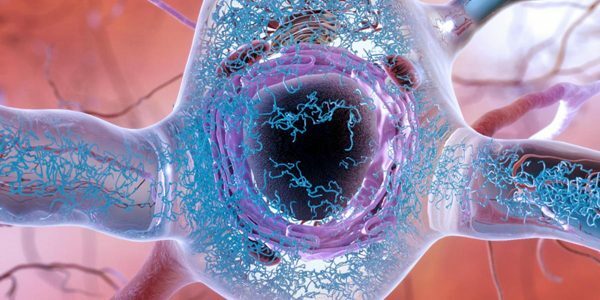 The results from the Merck's published study indicated that the damage to the brain may already be too extensive to be treated by any such class of amyloid inhibitor drugs, and the amyloid hypothesis may consequently be incorrect. However, in early July, Biogen (BIIB) and its Japanese partner, Eisai, announced that BAN2401 was able to demonstrate statistical significance slowing in clinical decline and reduction of amyloid beta accumulated in the brain after 18-months of treatment. Additional data will be available later this year at academic conferences. 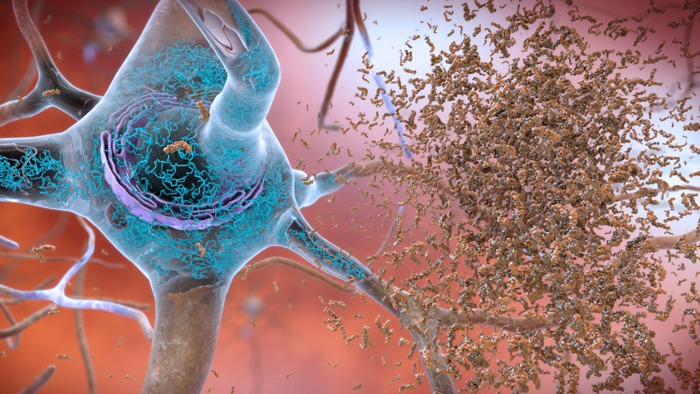 "New data provide compelling evidence to further support amyloid hypothesis as a therapeutic target for Alzheimer's disease." The news turned out to be a potent catalyst for the biotechs in general, and large-cap biotechs in particular, which had been suffering from high-profile disappointments including Merck's Verubecestat, and immuno-oncology combination of Incyte's (INCY) Epacadostat drug with Merck's, Keytruda. Everything is happening faster in biotechs than it was even a year ago. The pace of innovation is truly amazing, with new versions of technologies and therapeutic approaches emerging faster and well-financed. Perhaps from an innovation standpoint, it can be characterized as the golden era of biotechs, as was highlighted in the Biotech Bonanza 2018 and Biotechs Well-Placed articles. Gene editing is advancing in leaps-and-bounds, ushering in a new era of drug discovery. Last year, the first two gene therapy drugs were approved - Kymriah from Novartis (NVS) and Yescarta from Gilead (GILD) - which were both autologous therapies requiring customized T-cells. Significant efforts are being made to create gene-editing therapies that are quicker to process and cheaper to produce, with many companies pursuing an allogeneic approach, using generic T-cells, for targeted indications. The gene editing CRISPR technology is evolving rapidly with new advancements emerging nearly every month on a variety of fronts. The second generation of this technology is expected to be much sharper, and more forgiving. Presently, the DNA editing, in itself a complicated process, ends up making permanent changes using the CAS-9 enzyme. In March, a startup company, Arbor Biotechnologies, led by a key scientist of the original CRISPR technology team, formally unveiled what it refers to as a more powerful CRISPR version. Using a different enzyme called the Cas13, which allows for greater versatility in gene editing surgery, the process may not require snipping the DNA strand thus avoiding a relatively higher-risk permanent alteration. Instead, the new version will alter the RNA, which is a more reversible change in case of errors or unintended consequences. The present technology using the CAS9 enzyme uses two infectious strains of bacteria to snip at genes, introducing a layer of complexity to determine if the bacterial strains will survive a natural immunological response. A company, Homology Medicines (FIXX), partnered with Novartis, is using a different gene editing approach using the Adeno-Associated Virus (AAV) to correct genetic mutations. The viral vectors, using sterile AAV particles, have proven to be a safe strategy thus far for gene therapy, avoiding the need to manage an immune response. The above statement is not out-of-context as it can take up to 6-months to generate lentiviruses and up to a year when it comes to retroviruses, which presently constrains the rapid adoption of CAR-T therapies. The impact from the ability to create CRISPR templates rapidly can be compared to the profound impact on healthcare from faster DNA sequencing processes. As this next generation CRISPR technology is further validated in therapeutic human testing, it can open up a new vista of treatment possibilities for cancer and infectious diseases, like Lupus and HIV. 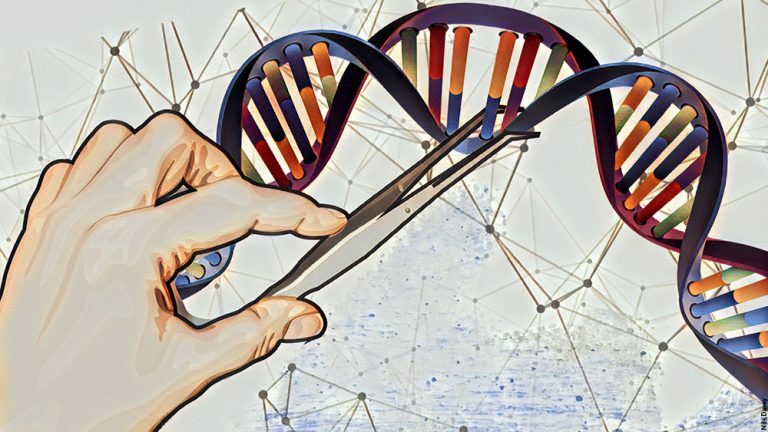 Such technology advancements are critical for gene editing to achieve its potential and overcome some key risks and imperfections involved in DNA editing, as pointed out in recent articles in Nature about DNA Strand Breaks and Unwanted Deletions. Today, investors continue to witness rapid advancements in biotechnology. 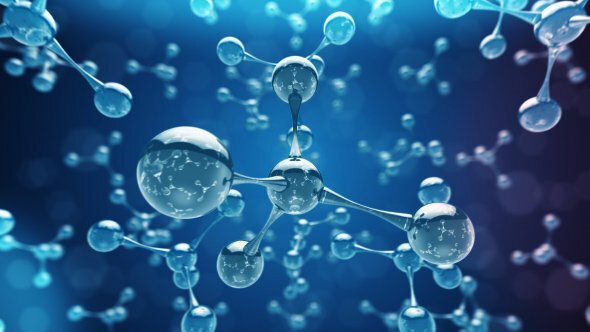 The dynamism creates promising opportunities that are being matched by easier access to financing opportunities for emerging biotech companies, the riskiest kind, through venture cap and public markets. 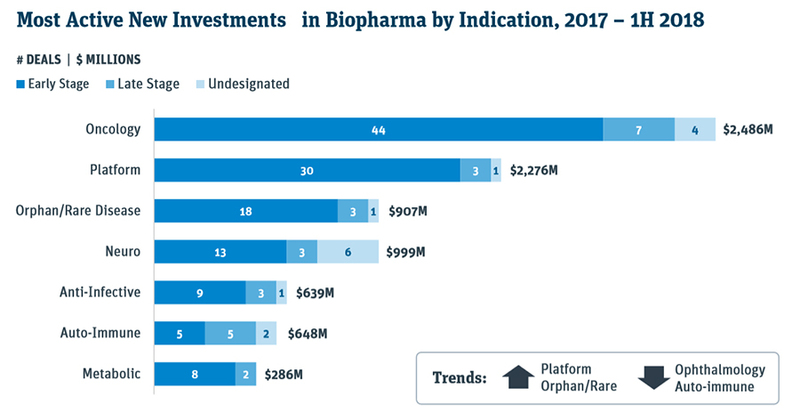 This influx of capital, particularly for platform companies, increases the probability of finding new pathways to therapeutic breakthroughs. In the first half, there was 31 biopharma initial public offerings or IPOs, compared to 30 for the entire 2017, which in itself was a very robust year. The venture cap series A financings for biopharma companies have reached $2.6 billion by mid-year, and already surpassed full-year 2017 total of $2.3 billion, as per a healthcare investment report this week by the Silicon Valley Bank. Much of the investment focus has been directed at oncology, platforms, rare diseases, and neuro fields. Does the surging IPOs and financings indicate a top? Not likely, in our opinion. The Nasdaq Biotechnology Index has not even made an all-time high, which was set in mid-2015. The pace of IPOs in 2018 thus far at 31 companies raising about ~$3.5 billion is definitely high, but not close to the pace set in 2014 when 84 companies came public raising nearly $8 billion. It is our belief that there is still room for the biotechs to run. When a rising number of seasoned pharmaceutical veterans emerge at biotech companies, it suggests a strong undercurrent of innovation luring them to high-risk, but promising biotechs pursuing new therapies. There have been many such instances this year, and one of the recent high-profile switches was when the former EVP of Business Development at Celgene (CELG), George Golumbeski, who had resigned from Celgene three months earlier, joined a cancer detection startup as its President. Former Biogen CEO, George Scangos, under whose watch the drug Tecfidera, a standard of care now for multiple sclerosis (MS), was launched, has now assumed a Board position at Octavia, which is building an MS platform. As the third quarter ages further, there will be a ratcheting up of political rhetoric around drug-pricing, right up to the November midterm elections. Pharmaceutical giant, Pfizer (PFE), had to retreat last week from its July 1 price hike of 9% for ~40 products, after the White House got involved. The Israeli generic drugmaker Teva Pharmaceutical (TEVA) raised prices on 14 drugs last month, while Roche raised prices on a number of its drugs on July 1, as per Reuters. However, last week Roche announced that it will no longer be raising prices for the remainder of the year. It joins Pfizer and Novartis, who have also announced no further price increases for the rest of the year. Pressure from the White House and an election year can make pharmaceutical companies hold the line on pricing. Rising drug prices remain a topmost healthcare concern for most citizens, and when biopharma raises its prices, justifiably or not, it does provide an easy target for politicians to highlight during an election year. The drug price related news will remain the theme for the second half and will add to the headline volatility inherent in biotechs. However, from an investing standpoint, one has to recognize that there is nothing new here and the drug price control effort this year has already resulted in an industry-benign blueprint, American Patients First, to lower drug prices. This year, in all probability, nothing more is going to occur to actually affect the drug pricing dynamics at the policy level. However, the outcome of the midterm elections can potentially raise the pressure on drug companies. Biotech investors were provided a strong opportunity in the first-half to be well-positioned for gains, with the small and midcap biotech stocks outperforming the larger biotech and pharma companies. The second half should again provide attractive biotech opportunities as the bull market continues. In a recent Second Half Outlook article, we had pointed out that the broader market will witness higher volatility from August to October, leading up to the midterm elections, as trade friction begins to create early-stage economic uncertainty and spur the decoupling of synchronized global growth. A favorable outcome or a broad resolution on the trade front can catapult the market to new highs as the earnings growth will finally begin to receive higher multiples. For biotechs, we anticipate the strong performance, with additional volatility, to continue in the second-half for appropriately positioned portfolios with a diversified exposure. We were fully invested in the Prudent Biotech portfolio entering July and will adjust the exposure as conditions evolve. 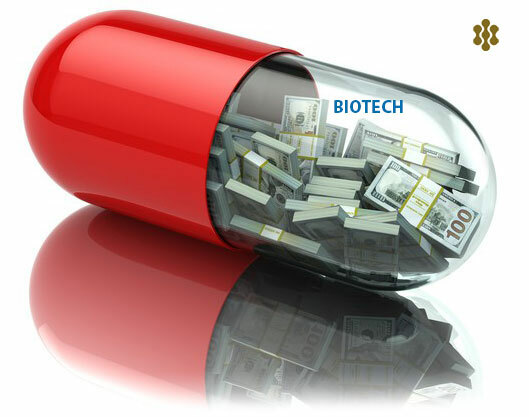 Some of the promising biotech stocks, which may be now or in the past part of our model portfolios, include Ligand Pharmaceuticals (LGND), Biogen (BIIB), Immunomedics (IMMU), Ultragenyx Pharmaceutical (RARE), Vertex Pharmaceuticals (VRTX), Loxo Oncology (LOXO), Regenxbio (RGNX), Sarepta Therapeutics (SRPT), Supernus Pharmaceuticals (SUPN), Verastem (VSTM), Endocyte (ECYT), Heron Therapeutics (HRTX), Zogenix (ZGNX), Arrowhead Pharmaceuticals (ARWR), Endo International (ENDP), Intercept Pharmaceuticals (ICPT), FibroGen (FGEN), Viking Therapeutics (VKTX), Acceleron Pharma (XLRN), and Neurocrine Biosciences (NBIX).